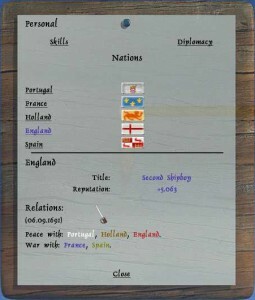 You can see your reputation points if you use the right click menu and press personal and then diplomacy. You can click each of the five nations to see your reputation points. 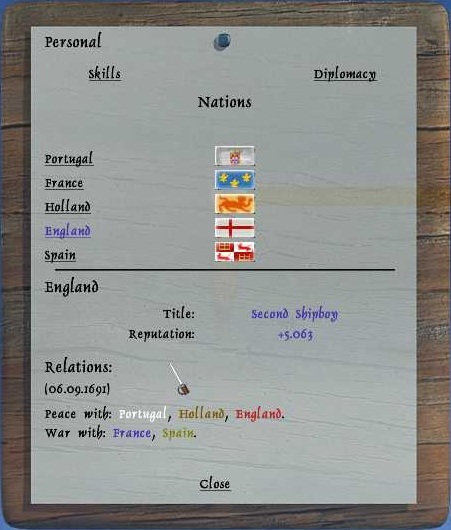 You can also see the war status and when it was last updated, you can update it by visiting a city of the nation you like to get an update at and look at diplomacy under the city hall. You can also see the war status on the high score here. Best way to gain reputation is to kills pirates, this will give you good reputation at all nations. If you kill nations your nation is at war with, you will gain good reputation at your nation. But bad reputation at the nation you kill and at the nations the nation you kill, is at peace with. Killing your own nation will give bad reputation at your own nation and the nations your nation is at peace with. But give good reputation, at the nation, your nation is at war with. You also get reputation points from trading, you gain 5x the reputation as the trade points you make, at the nation the city you make points at is. If the city is same nation as you are, then you only get 2,7x the reputation as the trade points you make. Learn all about trading here. You gain bad reputation from capturing a city, the loss is 10.000 reputation points, at the nation the city is. Learn all about city capture here.